"There is always something missing that torments me." Talented from youth, inspired by nature, and captivated by love, Camille Claudel unlocked the emotive power of sculpture after centuries of its subtleties having been obliterated by excessive polishing and focus on technique. Drawn intuitively to the innocence of children, the experience of old age, and the complexities of love and madness, Claudel exhibited great skill in the portrayal of raw and real emotions. Whilst sculpture until this point had typically dealt in hard and impenetrable subject matter akin to its materials, Claudel managed to peer beyond the surface and add transformative elusiveness to formulaic solidity. Sadly, following the end of her long-standing affair with fellow sculptor, Auguste Rodin, Claudel's own underlying delicacy unravelled and she experienced a psychological breakdown. As unsupported personally as she had been professionally, her own family placed her in an asylum. This action was the equivalent of caging a bird, and as Claudel could not fly in captivity, she instead became the living embodiment of her pain, a symbol of the destruction of love, existing only in her own despair. Although the woman herself died in relative obscurity, interest in her art grew organically and there is now a National Museum in France dedicated to Claudel's life's work. Every work by Claudel is infused with an intensity of expression, psychological investment, and sense of truth that is arguably lacking in the work of her male contemporaries. The likes of Alfred Boucher and Auguste Rodin had tendencies to overlay emotional reality and lived experience with projections of fantasy and a finishing sheen of beauty, and as such they neglected to explore 'meaning', or to move away from outdated neo-classical and imperial styles. It was Claudel who was keen to experiment - influenced by Art Nouveau and Japanese prints - her sculpture became 'expressionist'. Claudel's sculptures reveal an interest in relationships, and in particular the dynamism created by the gathering of small groups (including couples). Whilst the portrait busts that she made typically exude a sense of calm, her groupings emit abundant energy. Like others at this time (most notably Sigmund Freud) Claudel attempted to understand moods and behaviours that were triggered by human interaction. Like Edvard Munch, she worked repeatedly on the same subjects illustrating a tendency towards obsession. Claudel experienced ongoing torment in both her personal and professional life - due to being at best sidelined and at worst completely betrayed - and this writhing agitation was often made visible in her work. Professionally, her career was a constant struggle, from being one of the first women to formally study when such was still frowned upon, to later finding it difficult to gain financial support to help cast vulnerable plaster models into lasting bronze. Personally, she felt betrayed by Rodin who aided her emotional damage to such a degree that once institutionalized, she would no longer make art in fear that he would steal her ideas. 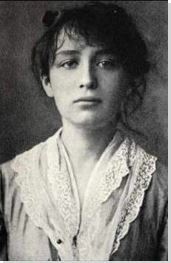 Camille Claudel was born in 1864 in Fère-en-Tardenois, Aisne, France. Her father made a living from mortgage dealings and bank transactions, and her mother came from a long line of wealthy Catholic farmers. The family moved from place to place, one of which was Villeneuve-sur-Fère, which made a deep impression on Claudel and the family would continue to spend summers there even after moving on. In 1927, Claudel wrote of Villeneuve to her younger brother, the poet Paul Claudel, "What joy if I could find myself at Villeneuve again! This beautiful Villeneuve unlike anything on earth!". It seems that the children enjoyed the landscape and atmosphere of this countryside home in particular, and may have contributed to Claudel's particular love of nature, and literally for the earth. When the family moved to live for three years at Nogent-sur-Seine - at which time Claudel was 12 - she was already working with clay. Her early work attracted the attention of the already successful sculptor Alfred Boucher, who advised her father to encourage his daughter's artistic career. In response to such advice, in 1882, along with her mother, Paul and her younger sister, Louise, Camille Claudel moved to the Montparnasse neighbourhood of Paris while her father continued to work elsewhere and supported the family from afar. 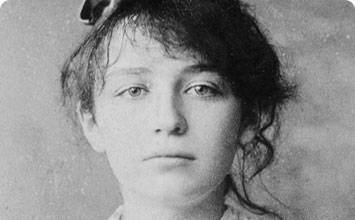 Interactive chart with Camille Claudel's main influences, and the people and ideas that the artist influenced in turn. First published on 07 Nov 2017. Updated and modified regularly.